Foraging, eating a variety of foods and actively seeking food is far more engaging for your parrot than just plonking some food in their cage and letting them get on with it. By making meal time fun, you will be able to boost your parrot’s wellbeing and improve their health, creating a happy and healthy pet bird. Choose a good quality food like our Bucktons Parrot Food range. It contains a variety of high quality ingredients and our unique Spiralife vitamin and mineral supplement to enhance the health and plumage of your pet bird. Supplement seed based diets with fresh fruit and vegetables, such as broccoli, carrots, peppers, grapes, mango, fig and pineapple. Make sure they don’t eat any pips as these can be toxic to them. 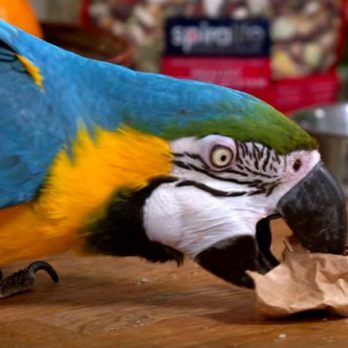 In the wild, parrots have to work to get their food. By replicating this behaviour you will provide interest and entertainment and stop them from becoming bored. 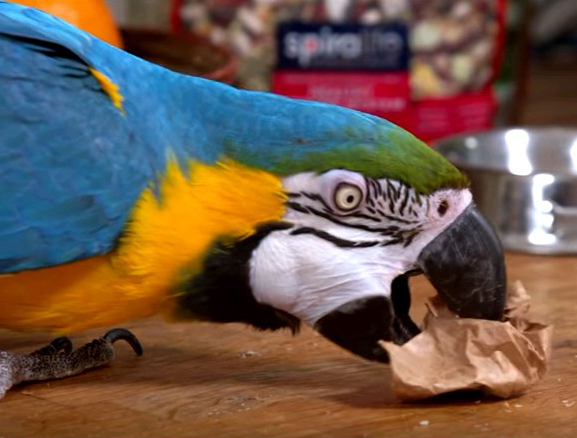 You can be as creative as you like, but make sure your parrot has to put in some effort to get to the food! You can try hiding food inside some sweet wrappers, brown paper or in toilet roll tubes to give them a bit of a challenge so they have to open it in order to get the reward inside. Try wrapping food in whole wheat wraps or lettuce leaves, creating a kebab by threading fruit and vegetables onto a wooden stick. Take your parrot out of the cage and set up an area on the floor with obstacles to climb over and under. Hide the food somewhere for them to find. Over time you can increase the area that you hide the food to encourage them to exercise at the same time. Blend fruit and vegetables to create a smoothie and freeze it in a small mould. This will take a while for them to get through, it will keep them busy whilst adding enjoyment and interest.